Advisors across the country are using Riskalyze to align client portfolios with client risk tolerance. They do that with new clients — selecting the closest model portfolio, which Riskalyze can quantify for suitability. And they also do it when they review an existing client’s portfolio. 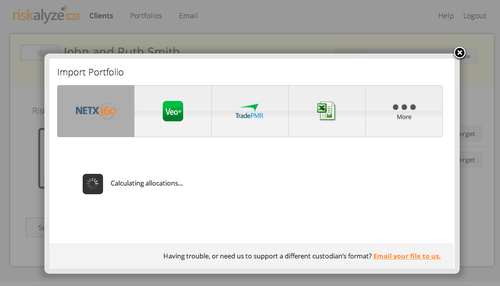 Today, we’re excited to announce that we’ve made the job of our advisors just a little easier by launching Drag-and-Drop Portfolio Integration inside of Riskalyze Pro. 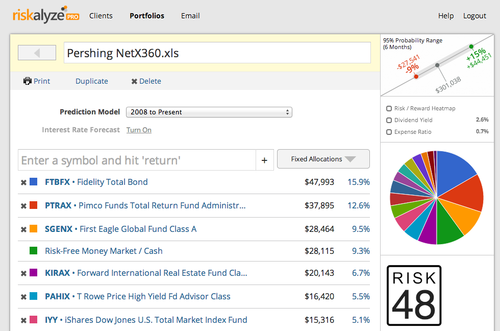 Out of the box, it’s drag-and-drop simple to bring portfolio data in for your clients from most major custodial platforms and hundreds of broker-dealers — platforms like Pershing NetX360, LPL, TD Ameritrade Veo, TradePMR, Fidelity WealthCentral and National Financial. And we’re adding more every week. When an advisor needs to use a different custodian’s file, they just email it to us…and we’re typically able to support it within 24 to 48 hours. Here’s how it works. 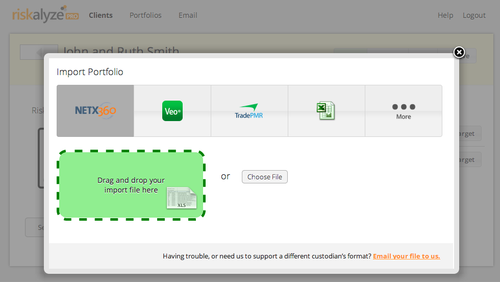 Every custodial platform makes it simple to drop an Excel or CSV file with the client’s holdings to your desktop. You open up that client’s profile in Riskalyze. You click the Import button and drag the file into the Riskalyze window. Riskalyze processes the allocations. If there are some new symbols you haven’t used before, it might take a minute or two. Often, it’s 10 seconds or less. Boom. The portfolio is imported, and you’ve got an instant risk score to know whether the client’s current holdings are in alignment with their risk tolerance. 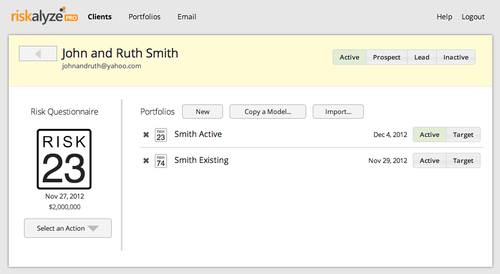 We’re excited to see how much time Drag-and-Drop Portfolio Integration is already saving our advisors who have been using it in preview. The feature is now live in all Riskalyze Pro accounts. If you aren’t yet a Riskalyze customer and you’d like to see this in action, click here to join a guided tour.